Well…Kotomi is less annoying at least to me. Knowing their audience, I suppose, Key couldn’t make Kotomi’s antisocial nature too offputting, the way the writers made Eriko in Kimikiss seem–though even they’ve turned her strange tastes for berry ramen charming. But Kotomi has it all: a penchant for books and libraries (massive win for me! ), doesn’t even know how to greet people properly (offputting in real life, really cute here–especially “Bon-joooooour?”), cowers at the thought of bullies, thinks she’s more talented at the violin and comedy than she is, and walks around barefoot. 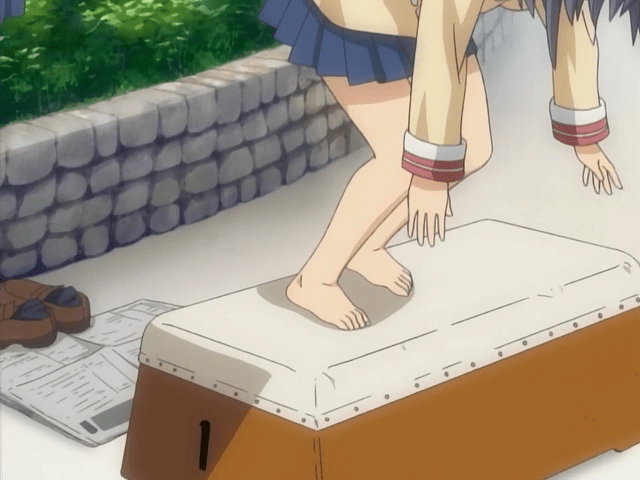 (My, she has cute feet.) I suppose it boils down to the fact that she is drawn attractively, is not a mean person, and is shy. Apparent meanness is what makes Eriko a bit hard to accept at first, after all, and shyness is moe. But of course. Plus, the strangeness starts with her immediately, the one that leads up to the revelations that are coming in episode 12. Yes, some of them are a stretch, the same way the Fuko arc’s revelations were for me at first. Inserting a man in sunglasses and a trench coat is really, really unsubtle. When they started talking about time and hidden worlds, I thought for a moment I’d stepped into one of Oshii’s Ghost in the Shell movies–though the scene was, mercifully, brief. 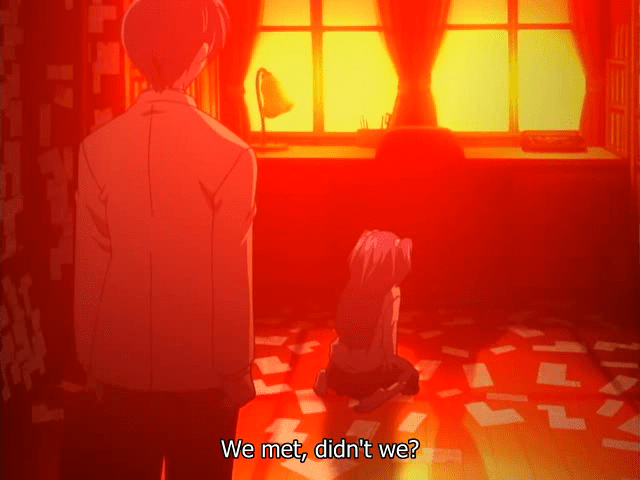 But when Kotomi and Tomoya spend some time alone in the library and she starts talking about rabbits, deer, and other things she has seen–followed by a bizarre dream sequence–I think that is an effective and concise way to talk about something weird going on with this girl, and why she is so strangely withdrawn, and that she sees things VERY differently. And that appears to be the key, so to speak. The rest is exposition. Which, I have to admit, I somewhat groaned at. Another forgotten childhood friend? But then again, I’ve always said it’s more about the execution. If they could “fix” the problems of the Ayu arc with Fuko, they might fix some more problems with this one–though it seems this arc ends with the next episode. They don’t have much time if that’s the case. Well, this continues to be an interesting show that is far more tolerable than its predecessors, and has the potential to be actually good as the Fuko arc as shown. I’ll definitely be continuing this into the new year. Fuuko’s appearance was out of place, I agree, but it was still hilarious. 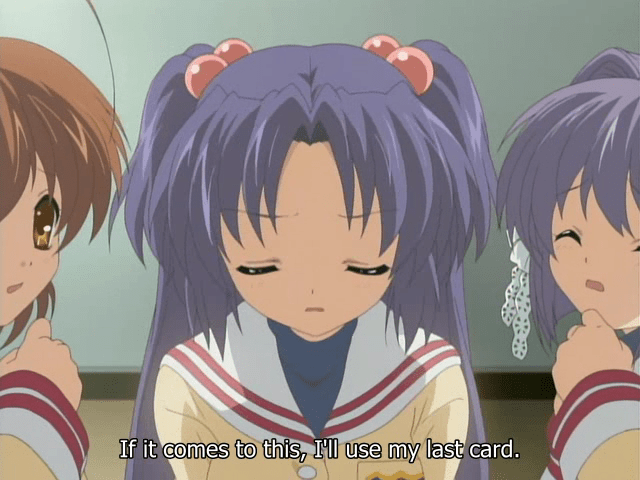 And Kotomi shocked me today with those emotions. The turn of the episode starting from there really got me into her character. It’ll be a hard three weeks of waiting for a new ep. The ‘childhood friend’ thing may sound cliche now, but .. I think fiction has just run out of unique things. Humans have been studying literature for over 200 years; there’s bound to be an upper limit to plot devices. But Key at least does these repetitions well. The ‘childhood friend / lost memories’ story allows for suspenseful storytelling, so we keep playing the game or anticipating the next episode. I just got around to watching this last night. The Fuko thing: out of place, yes, but executed in a kinda no-harm-no-foul situation. I guess KyotoAni is looking to break up serious bits with timed outtakes like these. I had less of a problem with this than the “starfish>Tomoya>sea slug” outtake at the end of episode 8. As for the “forgotten childhood friend” thing, that didn’t bother me to much. KyotoAni is pulling the “as long as we can execute, we can take on any plot device” card. I can deal with this since at least Tomoya remembers a major part of his life immediately whereas Yuuichi takes almost all of Kanon to figure it out. My concern is from the end of this episode and preview. Tomoya looks to solve the problem by himself. Even with KyotoAni execution, I’m concerned that they will end up breaking this “cooperative solving problems as a group” mantra and collective character development that comes with that. But once again, I will place my faith in KyotoAni’s abilities. was I the only one that thought this episode was dissappointing? I HATE harems… and Tomoya basically went on a group date with his personal harem. grr. @Crisu: Yeah, I just found out that nothing new will be shown until the new year. There goes one of my blogging staples for a while! And yeah, while there are only really like 6 or 7 basic plots in fiction anyway, the “forgotten childhood friend’ is a particular cliche that is common in this sort of anime. Of course it can be done well, and if the show maintains its high level of direction Clannad might do it. Especially in the light of the plot of the story “The Dandelion Girl.” I wonder if they are going to borrow more from that story. @koneko-chan: The insertion felt forced to me. Were it more smoothly integrated I’d have fewer complaints. And you bring up a very interesting concern that I’ll be watching out for when the next episode comes around. I don’t know… I just… maybe feel.. too much like Kanon at this point. 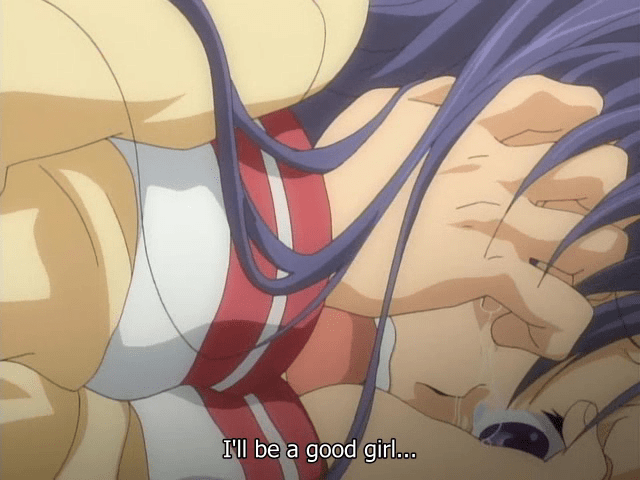 I love Kotomi’s character, but I hate where this story is going. Trite. Late comment, but I actually laughed and cried at the same time when Fuuko appeared. I’m probably alone in this, but her reappearance lent both comfort (she’s still alive!) and humour to a situation that’d have otherwise been full of the usual clichés and hijinks.